This week I've taken a different approach to viewing our Top N Customers in Superstore. I recommend clicking the picture below to see the viz on Tableau Public. Interact with the viz to see what's required this week. 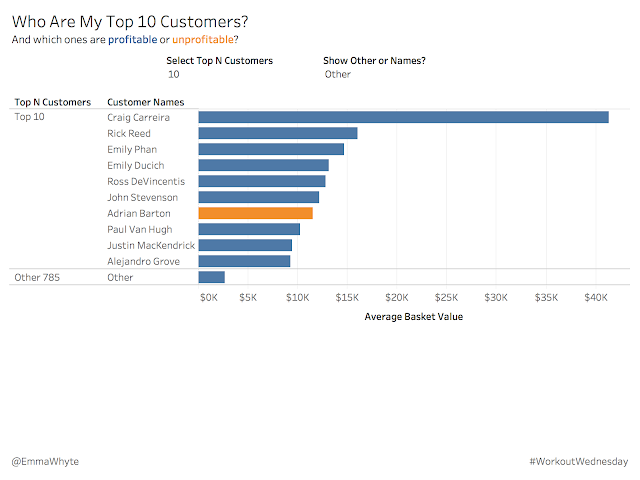 Top customers is defined as those customers whose average sales per basket (order) is highest. You'll need to download the data to re-create this viz. Once you've recreated the viz send us a picture of it via Twitter to @EmmaWhyte and @VizWizBI and remember to use #WorkoutWednesday. Have fun!